Rihanna recently debuted her new Savage X Fenty collection during New York Fashion Week (NYFW) where she showcased her lingerie line using women of all colors and sizes. 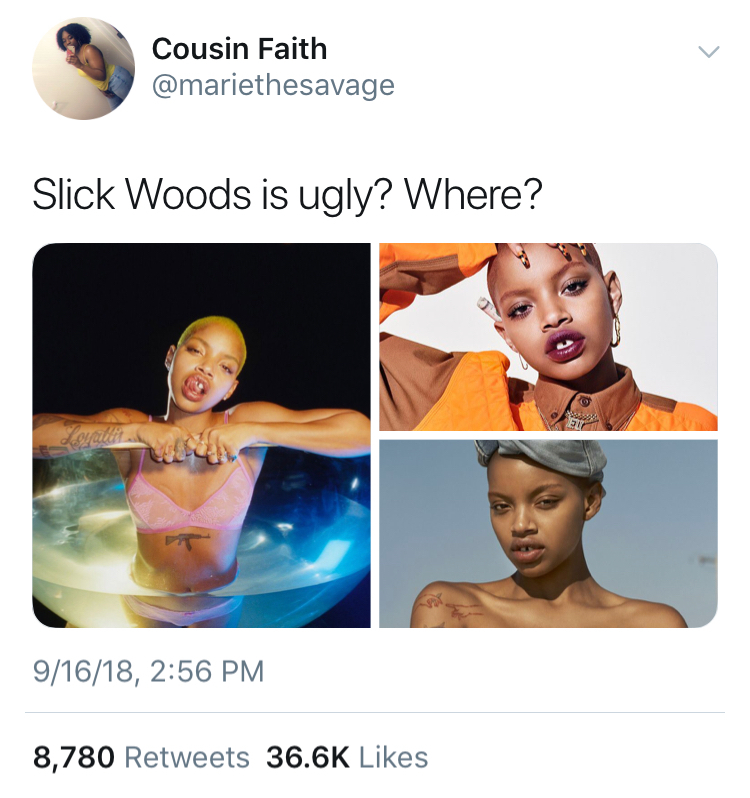 While the focus should be on how she is using her platform by giving Black women a chance to be a part of something we are historically overlooked for, a lot of attention has lead to unwarranted debates via social media about the beauty of her muse Slick Woods. Men (and women) are engaging in an open dialogue about a woman who not only is beautiful, but a woman who walked the runway while in labor. Did you know according to studies, Black mothers face significantly higher maternal mortality risk due to stress and “the system not valuing the lives of Black women equally to White women.” (Renee Montagne, NPR News, 2017)? Meanwhile, the concern of our Black men on twitter is what she looks like, rather than praising her hard work and perseverance in the industry. It is for this very reason, Black women find it extremely difficult to be comfortable in our own skin. People within the Black community combined with society’s overall beauty standards have conditioned us to openly disrespect Black queens by publicly calling us ugly and not valuing what we contribute to the universe. You would think the same men we uplift, pray for, sacrifice for, and fight for against the masses when they are being killed off would do the same for us, instead of giving the world more of a reason to continue to disrespect us. The world is already twice as hard on Black and brown women, where are the Black men willing to stand on the frontline for us? According to the Washington Post the percentage of women of color to walk the runway during NYFW in the mid-90’s was pretty close to 0% (Robin Givhan, 2016). Instead of our community uplifting the women such as Slick Woods who have broken that barrier, we continue to bash her “unconventional” looks by downright calling her ugly and unworthy of being the face of one of the number one beauty lines in the world (Fenty Beauty). What is an unconventional look? Has mass media really programmed us to believe that plastic surgery enhancements and “exotic” features are the definitions of beauty? We continue to shame those who love their natural bodies, and embrace their flaws, especially us Black women. The fact that we have more discussions about the standard of beauty over the fact that Black women are the fastest growing group of entrepreneurs (Forbes, 2017) in the U.S. continues to prove that Black women are under appreciated and the need for self-love, self-care and self-appreciation amongst ourselves as women is important. No matter how strong we are as women, the truth is we rely on our Black men to support us, especially emotionally. Instead of making a mockery of these discussions, I challenge you to call your bro out when he’s openly displaying signs ignorance towards us Black queens. It is the responsibility of men to keep each other accountable, because we as women are tired of nagging and having to defend ourselves against the world, let alone the men in our own culture. There are so many platforms and mediums that men have access to and have created to start the necessary conversation. Don’t be afraid to be “that guy” who stands up to talk about these issues on social media, in your group chats, on your podcasts, or even at your guy’s night. While beauty is subjective, to ever engage in negative conversation publicly about the beauty of a woman is unacceptable. As our Black mamas say “keep it cute or put it on mute.” Have your preference, but always exalt us Black women by any means necessary. 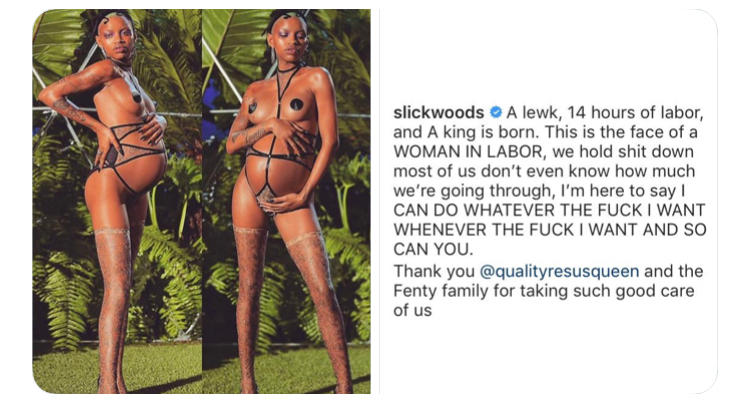 Slick Woods continues to be the epitome of black girl magic and rise above the standards not only that society sets, but what our own people have set. Her defiance of what society believes is beautiful makes her an even more powerful force in the industry. Continue to slay on Slick for ALL of the Black queens out there. WE have your back, and hopefully moving forward our Black men will too. Christina Hammond (Nina) is the author of #1 Best-Selling Amazon Book “Do It For The Gram: A Quick Caption Guide For the Millennial Woman” , and serves as a creative strategist to several talent and brands in the entertainment industry, with a specialty in events.